"We had a blast!! Our guests said the cruise was a real treat. You have absolutely fabulous staff and vendors! The staff were all an absolute joy to work with. They were friendly, efficient, worked very well together and also very fast without being hurried. So many compliments about how wonderful the staff and crew were. Special thanks to Tara. There were so many compliments on the food! Thank you very much!! We booked this on blind faith but it turned out better than we expected." "I wanted to take a moment to thank Kim, Helen, and all the staff of the Carolina Grace for an unbelievable event. My now-husband was so blown-away by the boat when he toured it, that I agreed (sight-unseen) to book it for my “surprise” birthday party/our surprise wedding. He sent me pictures from his cell phone, but those did not do the Carolina Grace justice! Planning our party/wedding was extremely low-stress and everything came together so perfectly. Helen and the rest of the boat staff were so sweet and rolled with it when the “surprise” party became an engagement party and then became a wedding. There was plenty of room in the private cabin for getting dressed, and our friends all had a great experience. 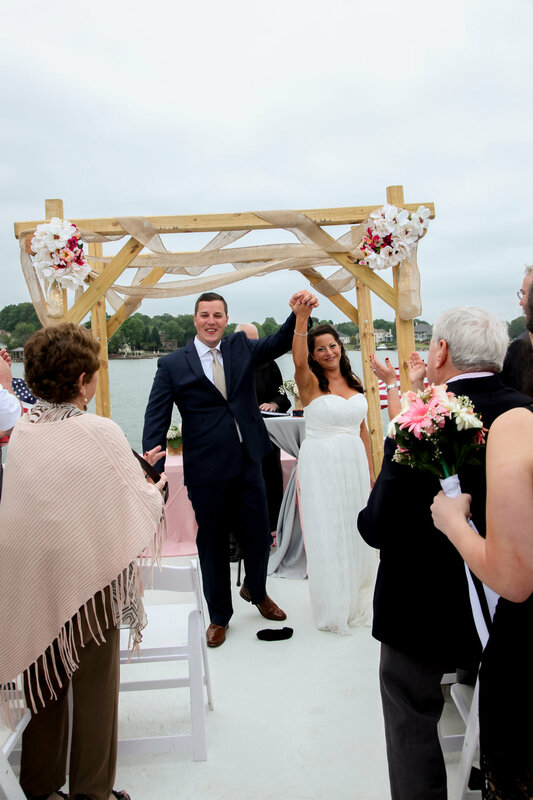 It was the wedding of my dreams – thank you so much for such a beautiful venue and a wonderful staff!"